If you liked the Nine West “rose dot fan print dress”, you might like this style too. 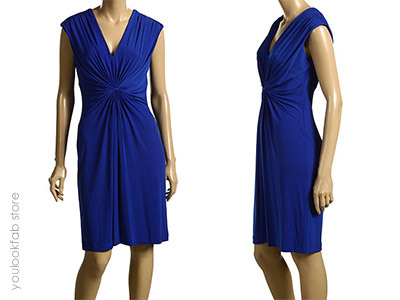 It’s got flattering front knot detailing and drapes in a similar way. Great for defining the waistline, whilst camouflaging those extra bits around the midriff. When compared to the Nine West dress there are differences to note aside from the colour and being sleeveless: it’s longer, not as full on the bottom, more plunging in the neck, and in a less weighty fabrication. All in all, it’s a more Summery interpretation. I wish that the dress had a more cut away sleeve just because I think that’s a more flattering line than the grown-on sleeve. But you might prefer the extra coverage and it’s still a pretty look. The neckline is ideal for gals with shorter necks and/or fuller bust lines, and the length works for taller gals too. Again, it’s a “dry clean only” label, but you might be able to get away with the hand wash in cold water on your delicates cycle in the washing machine (and hang dry). This is how I wash most of my dry-clean-only frocks and no disasters so far. I’m bummed I missed out on the printed dress, but adore this one nearly as much. Love that vibrant blue! LOVELY and I can picture all sorts of layering options with it, too. Very pretty dress and even prettier color! Beautiful dress – I wish it came in other colours! Fab design and yummy color. I love this color and style! I might have to give it a try. This is very pretty – to me, particularly because of the wider “grown on sleeve” – more cutaway sleeveless tops are not particularly flattering to my shape, as I’m narrower at the shoulder than at the ‘bottom’! And these hide bra straps better. This was already in my Zappos wishlist, hehe. This is such a sweet coincidence Angie! I spotted this dress at Ross the other day and took pictures to post in the forum alerting everyone to it. I’ve seen at Marshall’s too for about $40 and in lovely summery colors. If it doesn’t come in a petite, this might not work for short-waisted petites. I tried a regular and the knot placement just seemed off to me. I hope I’ll be able to get around to posting the pictures today. Stunning dress and I love the color! Gorgeous dress style and colour!!! Your comment about working for apples and tall girls has really piqued me interest – I’m finding summery dresses that meet that criteria are hard to come by. This is officially on my favourites list and if I ever make an order from zappos I will be sorely tempted to give it a go!!! I saw this dress in a gorgeous teal and poppy today and the fabric is buttery soft. It also comes in a petite. ELPGAL, where did you see the dress in the teal & poppy, and in petites to boot? I adore this dress, but I would need it in petites. Please do share the store & city where you found it! Thanks in advance. They have this dress at my local Ross store for just $30! They had it in this blue, a lovely green, and a bright coral-y color. Alas – they had none in my size. Oh very yummy with white beads. I love this dress.